There are three shooting categories in Para Archery. This is an article by Eric Bennett that describes them. Click here or on the picture to see the whole thing. 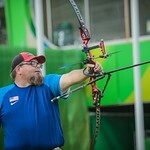 Disabled Sports USA and USA Archery worked together on an Adaptive Archery manual. This is not the final copy, but it's mostly complete. Click here to see it. You can also click here to download on the Disabled Sports USA website. If you click on the slide to the right or above (depending on how it displays on your computer), it should open into a PDF presentation that I put together on adapting archery and teaching people who have disabilities. It’s really not difficult and it really is a lot of fun. The release glove in this presentation is a batting glove that we had a shoemaker adapt. He put holes in the fingertips (like you would put a shoelace through and others in the palm. Again, look at the pictures! For beginners, and one time clinics, mechanical releases with wrist straps often work well. Find a place on the face where the individual can touch the release to set it off. However, remember there will be a follow through - where there’s an action, there’s a reaction!